InterFAX Web Fax Form is a simple online form enabling you to send individual faxes or fax broadcasts easily and quickly. 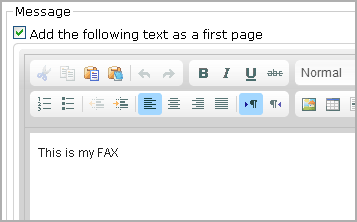 The unique service is equipped with a Microsoft Word-like editor for writing and editing introductory fax pages and for uploading attachments. Featuring a user-friendly control panel for rapid customization of large numbers of faxes, including InterFAX lists, Web Fax Form also lets you easily personalize faxes from a pool of thousands via its advanced mail merge feature. Web Fax Form features a Microsoft Word-like editor interface that simplifies the writing and editing of introductory fax pages. 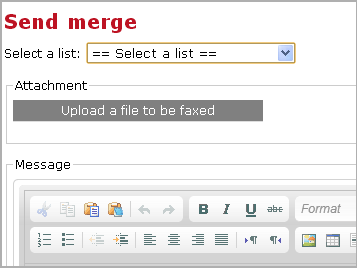 With Web Fax Form, you can upload up to five attachments to your fax with the simple click of an icon. Web Fax Form enables you to personalize faxes from a pool of thousands via its unique mail merge feature. 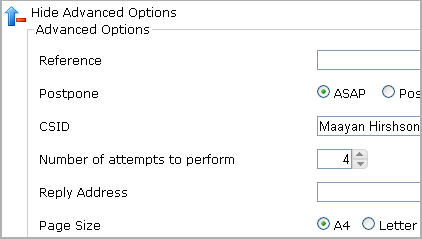 Just select a recipient list from among your InterFAX lists, add text and merge fields to the message area; InterFAX does the rest, sending out fax broadcasts whereby each fax includes the individual recipient's name and personal information. You can also preview a sample before sending to ensure that everything is to your liking. Web Fax Form includes a set of advanced options for easy and rapid customization of your faxes. Options include adding text to a text box for referencing faxes in the outbound queue, postponing fax sending to a specific time/date, and defining page orientation, size and default resolution.